When cars drive themselves will you still want to own one? Recent posts on National Public Radio and The Washington Post point out Google’s driverless cars have already logged 300,000 miles without a single accident, making it clear this technology will come to the forefront sooner or later. Simultaneously, USA Today has revealed the extent that modern cars spy on their owners, in some cases with their full knowledge, but in others the owner haven’t a clue this is going on. Nevertheless, we wonder when cars drive themselves will it break the emotional connection between the passenger and vehicle. resulting in a feeling more in line with a toaster or blender – something you probably lack an emotional investment in. Of course maybe you shop at IKEA or Neiman Marcus, in which case we might be wrong. It’s just we’re thinking it might not be something everyone would buy into, but it’s obvious why the government and insurance companies might. Autonomous vehicles completely remove liabilities from the occupants, except in cases like buses and planes where you could cause a problem with the proper operation of the conveyance. On the other hand, you could text to your hearts content, drink or party in the car, surf the web, heck there would probably be some folks who’d get a kick out of hooking up in a self driving car. Presumably, you could just tell it to circle the park until told otherwise. Autonomous cars could easily be on our roads within the next ten years, but that’s just the beginning. We’re looking further down the autonomous road. Here are some reasons they might become public transit, like buses and trains. Many US cities are simply not navigable on certain roads and at specific times of day. Putting all of this in the hands of the same computers that manage traffic flow already would allow them to do their job much better, lessen the time commutes would take, and put government in a position to promote ride-sharing on a level with Big Brother, whether on not that is a good thing. The simple fact is at the current rate of population growth, to maintain the basic movement of people and goods necessary to our economy and way of life, the government could outlaw private ownership simply by making the fees and registration costs prohibitive, in the name of commerce. The cost of insuring a car can be daunting, especially if it has high monetary value. If autonomous cars became part of a public transit system, perhaps corralled at Park N Rides similarly to public use bicycles, the casual passenger would be freed of that expense, not to mention the liability for anything the car might damage. They would not be in danger of DUI convictions or speeding infractions and parking would simply not be an issue – it would be like valet parking everywhere for everyone. Chances are by this point in time autonomous cars would be electric, though the paradigm could easily vary from one region to another. EVs require much less service than the typical ICE vehicles, other than charging. Regardless, it would no longer be the passengers’ responsibility to maintain or service the vehicle. You would simply call up CarRide on your smartphone or tablet and the closest one not in use would head your way. It would also provide a handy excuse for tardiness as your personal device would reveal the time you called for a ride and thus any delay in getting one. Public autonomous cars would clearly put the transportation responsibility for environmental stewardship squarely in the hands of the authorities, for better of worse. If the gridlock in our cities can be vaporized by public cars and computer traffic guidance, how may would really oppose it? Certainly the cars will doubtless have video surveillance within, which will both indict and defend you from accusations of errant behavior. Of course, those that like to hook up in cars may find themselves all over the internet, because public employees are, after all, mostly human. We should also note, we ourselves are the greatest impediment to autonomous vehicles. I have one friend that has great trouble with any form of public conveyance, be it planes, trains or buses, simply because relinquishing control disturbs him. I’m sure he represents an entire segment of humanity. There is no reason to believe this reality is part of any near future. Autonomous cars could be on our roads within 5 to 10 years, privately owned and functioning flawlessly. Unforeseen mishaps with the technology could completely defeat the trend. The future is not easy to predict. The institutionalization of driverless cars is something that might occur in a more distant future, say from 25 to 50 years from now. After they become a more common part of everyday life. Plus, this is merely the speculation of a writer who only knows enough to be aware of how little he really knows. The manner in which the technology we are developing will change both mankind and the world we live in is unfathomable – this is but a briefly glimpsed personal impression of the world yet to come. Your thoughts on the subject are most welcome. Image: The Smarter Car: Participant in ELROB2006 to demonstrate fully autonomous navigation and 3D mapping in outdoor setting. 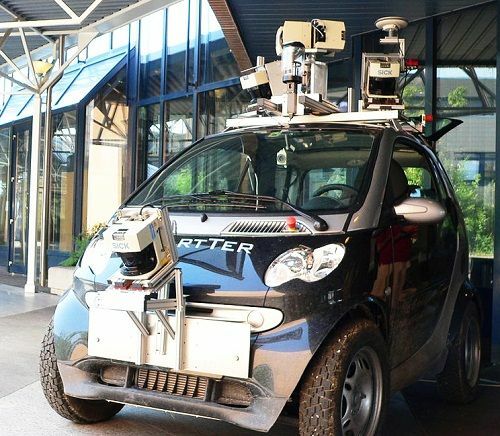 The robot was based on a standard Smart car that had been equipped with five distance laser sensors, three cameras, a differential GPS and an Inertial Measurement Unit (IMU) and four computers. Image by Rama. Used under the Creative Commons Attribution-Share Alike 2.0 France license.